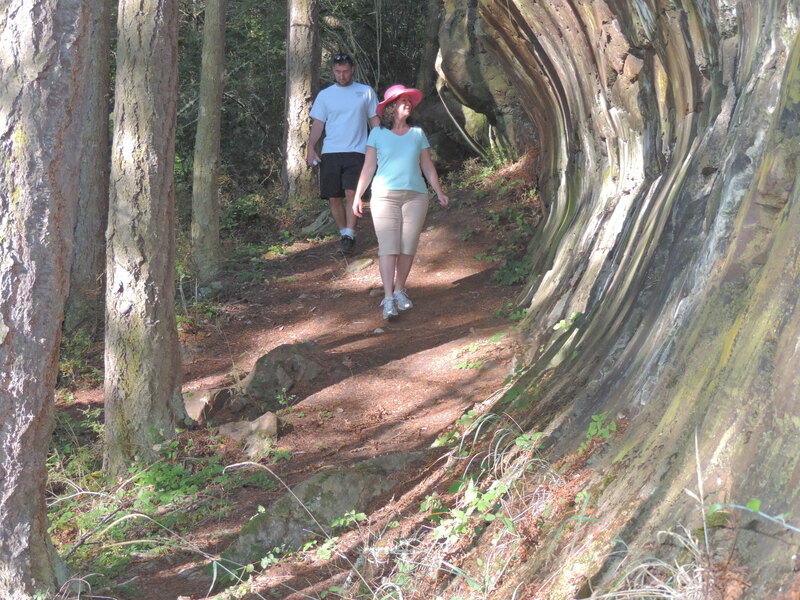 Glacier carved outcrop in Washington Park, Anacortes Island, WA. Since this first geocaching trip, I have found more than 200 geocaches in places small and remote and places large and urban. The treasure is in the walking and trying to find a path towards a destination, but the destination is secondary as many discoveries are made along the way. 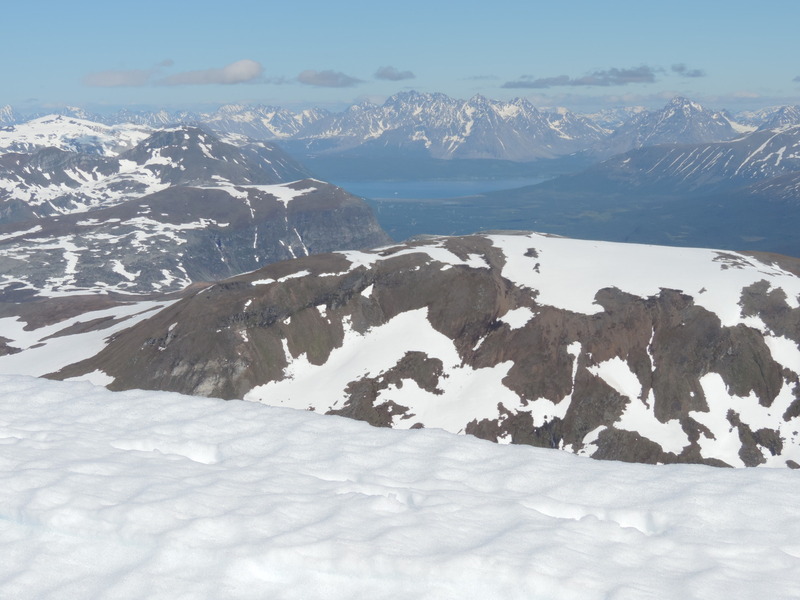 View to the south on the decent from Tromsdalstinen on a geocaching trip in 2014 out of Tromso, Norway. 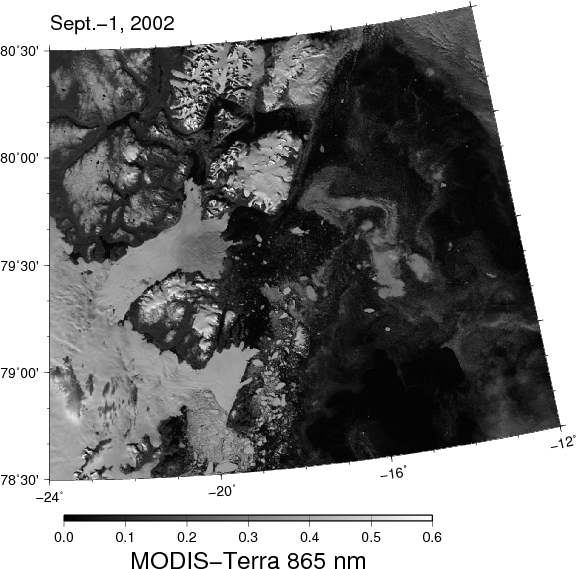 North-East Greenland in 2002 when both 79N Glacier (near 79 30′) and Zachariae Isstrom (near 79 00′) had extensive ice shelves (black areas are open ocean). 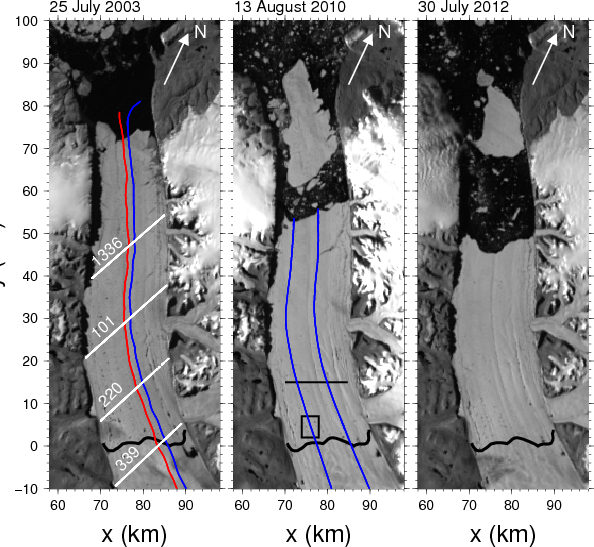 Petermann Gletscher through calving events. White lines show ICESat tracks; red (ambient ice shelf) and blue (central channel) show repeat-track airborne surveys. The hardest part in reaching this goal is to get measurements from under the 200-600 meter thick ice. This requires holes drilled through the glacier, it requires ocean sensors to be lowered into the water below the glacier, and it requires connections to relay data back to the surface at all hours for many year. I perhaps have a first chance towards this goal when the Swedish icebreaker Oden will work for a month in Petermann Fjord this year. People from the British Antarctic Survey will be aboard and they plan to drill holes for other scientific purposes. When they are done, the holes freeze over, unless someone (me, me, me, please, pretty, pretty please) has instruments to put in there. I just word that I will be aboard the ship as well and I am feverishly working towards this goal with much help from others. More on this in later posts. All science is a group effort. I close with a photo to show how the ice-covered ocean of Petermann Gletscher looks during the polar day. Would it not be great to know the temperature of the water below and the air above this more than 200 meter thick glacier ice at all times posted for everyone to use with an internet connection? March-24, 2010 view of Petermann Glacier from NASA’s DC-8 aircraft. 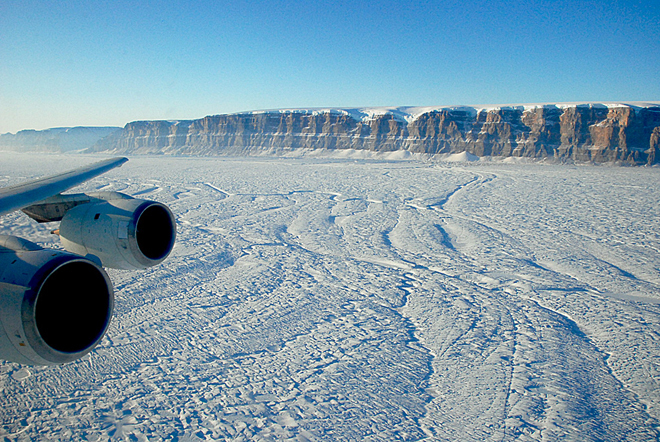 Photo credit goes to Michael Studinger of NASA’s IceBridge program. This entry was posted in Greenland, Petermann Glacier and tagged glaciers, Greenland, moorings, Petermann, travel. Bookmark the permalink. Thank you; a great challenge to figure out how to do that.